This post has already been read 14565 times! StorMagic (a UK company) has a very interesting and cost effective product called SvSAN which is a iSCSI Virtual SAN specifically designed for Remote Branch Offices which require a local HA storage infrastructure and central management. Today Stormagic announces a new collaboration with VMware to deliver a 2-node HA Storage Solution for the existing VMware Remote Branch Offices edition. The VMware vSphere Remote Office Branch Office Edition (datasheet) will combine vSphere with StorMagic’s SvSAN to deliver virtualization and storage in ROBO environments with just two physical servers. The VMware vSphere ROBO Edition contains a 25 VM pack (All VMware and SvSAN licenses packed together inside a single VMware SKU). It must be said that every 2 node server configuration needs a whitness. running on a separate machine. Stormagic SvSAN currently supports VMware and Hyper-V. KVM and Xen support is currently being worked on. The ability to maintain application uptime and data availability without the need of an array on every location. Lower CapEx, with less hardware (a minimum of 2 rather than 3 servers). Lower OpEx, including less complexity, which eliminates the need for onsite IT staff. 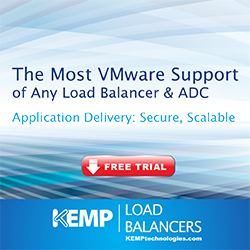 Support for VMware vSphere and Microsoft Hyper-V hypervisors. Integration with VMware vCenter and Microsoft System Center. Scalability by simply adding storage capacity to the onsite servers to expand the virtual SAN. 25 virtual machines priced at $3,000 for the Standard edition and $4,500 for the Advanced edition. Where the Advanced Edition has additional features such as 4CPU FT, Host Profiles, Auto Deploy and Distributed Switch. This offer includes all VMware vSphere licenses except for vCenter which is sold sperately. Compared to VSAN at $2,495 per CPU socket. 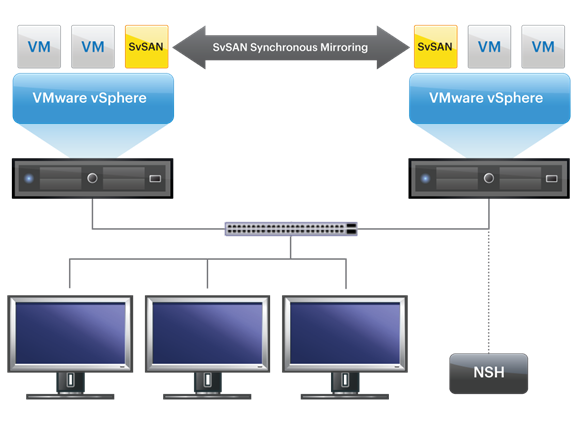 This makes SvSAN a great low cost solution for the Remote Branch office. A 3 node VSAN cluster (minimum) with 2 CPUs each, VSAN licensing would add $14,970 to the infrastructure costs. For ROBO environments there is often a compelling architectural need to keep certain key applications running remotely yet with centralized management capabilities. With this joint VMware & StorMagic solutions it is possible to build a highly available solution that address all the requirements of the remote branch office and keep the costs down. With the VMware VSA no longer available this looks like a great solution for ROBO. Pricing virtual HA Storage Software based on Hardware SAN`s which are really expensive, is a bad joke. VMWare does this wrong and StorMagic does the same error. Its time that a newcomer starts pricing on a fair base. Can anyone recommend me a VSan open source solution that works and its easy to use for SMB?